Edward Hirsch is the author of seven poetry collections and four works of prose, including the 1999 national bestseller How to Read a Poem and Fall in Love with Poetry. He is the President of the John Simon Guggenheim Memorial Foundation, and lives in New York City. His books of poetry include Wild Gratitude, winner of the National Book Critics Circle Award, and Lay Back the Darkness. His latest, Special Orders, has already been acclaimed as his most personal and revealing collection. In a comment that applies to all of Hirsch’s work, fellow poet Anthony Hecht said of Wild Gratitude: "[I]t has not only the courage of its strong emotions, but the language and form that makes and keeps them clear and true." 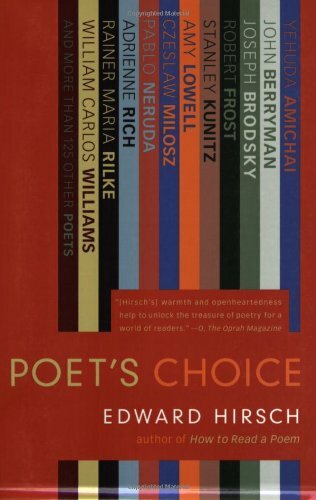 Poet’s Choice collects 130 poems and Hirsch’s thoughts on them – taken from a column he wrote in the Washington Post Book World for several years. He co-edited The Making of a Sonnet: A Norton Anthology, which is also being published this spring. "I can't reconcile myself to the fact that he is gone. The night before he passed away I stood on the sidewalk outside his apartment building and burst into tears. I was grieving in advance. I couldn't bear to be without him. I still can't. William Maxwell knew something about inconsolable grief. People hurried by on either side of me, but no one even glanced my way. It started to rain. The night opened its arms. New York City is a place where one can weep on the sidewalk in perfect privacy."